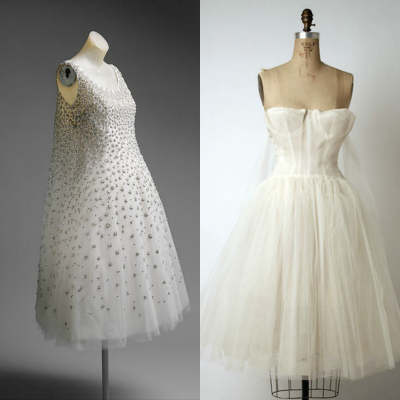 First presented to the world in 1947, the Dior New Look is responsible for changing 1950's fashion history for high society and Main Street mavens alike. 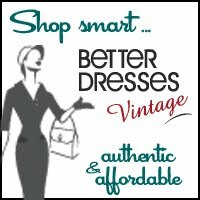 Women everywhere embraced the new softly feminine "Look" with its rounded shoulders, cinched waist, and full skirts in a longer length. 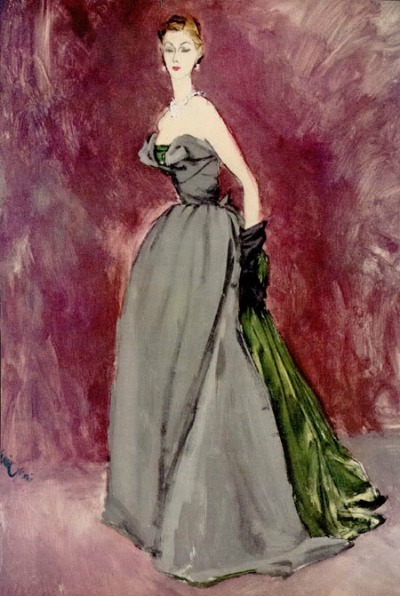 The steel boned corsets that had lost favor during war times were re-introduced in order for women to properly execute the wasp waist fit of Dior's designs. Founder of one of the world's top fashion houses, Christian Dior was born January 21, 1905 in a small seaside village situated on the coast of Normandy, France. His parents were a wealthy manufacturing family yet their second child, Christian, longed for a career in architecture. After moving to Paris, and at his father's urging, he enrolled in the Ecole des Sciences Politiques. His parents hoped he would become a diplomat. Completing the required military service, he returned to Paris and was hired by Robert Piguet in 1938. After his service in the South of France during WWII, he returned to Paris in 1941 and worked for Lucien Lelong Design House. Coincidentally, Pierre Balmain was also a protege of Lelong. By his own accounts, he and Balmain had no rivalry between them and were friends. With the backing of a textile manufacturer, The Christian Dior Design House was able to open in 1946. 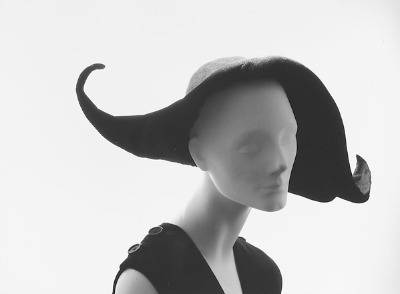 Because of the shortage of materials during the war, he concentrated initially on elaborate hats that he could fashion from scraps of fabric. Following the fabric conservative measures during the depression and war times, Dior's 1947 couture show featured the first luxurious fashions seen since before the war. 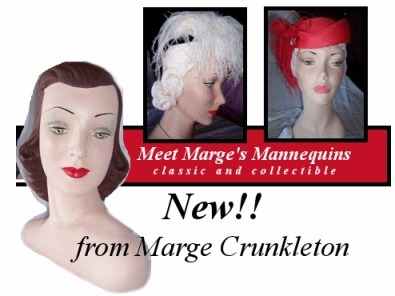 They were called voluptuous with their cinched waists, bustier-styled bodices, and voluminous petticoats. The Dior New Look was a fashion sensation. 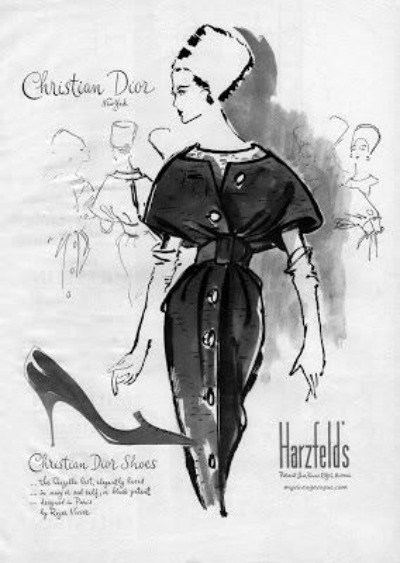 Following the success of Dior "New Look" in women's dress, the fashion house was flooded with orders from Hollywood stars and New York society women. He was invited to present a private showing for the British royal family even though King George V is said to have forbade the princesses Elizabeth and Margaret from wearing Dior designs for fear it set a bad example at a time when rationing was still in force. 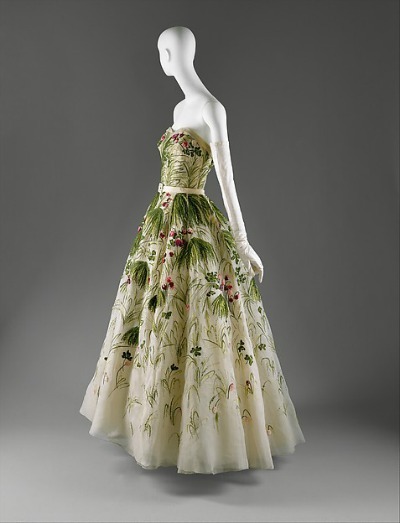 With his ever changing fashion designs during the fifties, Dior became a sensation and an undisputed worldwide couture master. 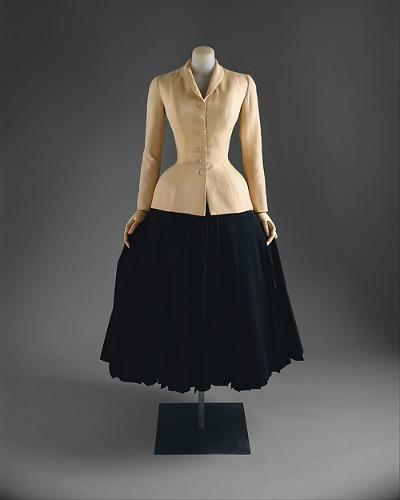 Leaving the fashion scene with his Fall and Winter 1957-1958 season, Christian Dior's complete departure from his original 1947 designs was quite surprising. The "Spindle" or sack line featured a loose fitting shape that ignored the waist and barely acknowledged the bust and hips. The artistry and elegance for which he was known for the last decade remained. Although he was a plain, rounded gentleman, and by his own admission, so painfully shy he could hardly bear to bow to the audience after his shows, his presence was sought at many society events. 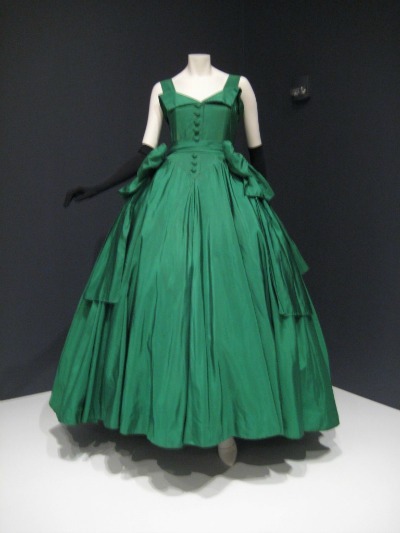 Dior reportedly took little pleasure in the arts or entertainment and therefore seldom lent his name to costume designs. Quoting from his autobiography, "Modern dress must be straightforward and dependable. The designer must plan a dress for long use, even if it is only worn for a single evening. Fantasy for the sake of fantasy, extravagance for the sake of extravagance, belong to the world of costume, not fashion. Fashion is destined to be worn elegantly in the streets and drawing rooms, and must obey its own strict rules." The Dior New Look did just that. Feeling he had never lost the simple tastes and habits of his childhood in Normandy, he tried to build his fashions on a solid base. His hobby remained architecture where he designed his homes and gardens as he did fashions. He was thankful couture had given him the money to gratify his passion for architectural design. 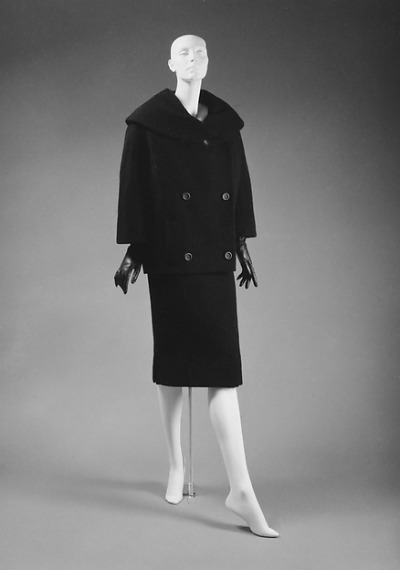 Dior attracted some of the most gifted assistants with a 21 year old Yves Saint Laurent contributing thirty-five outfits for Dior's 1957 collection. Ten days after completing the fittings, the creator of the Dior New Look died of a heart attack while at a spa. Saint Laurent was made responsible for preparing the first collection after Dior's death. It too was a hit around the world. 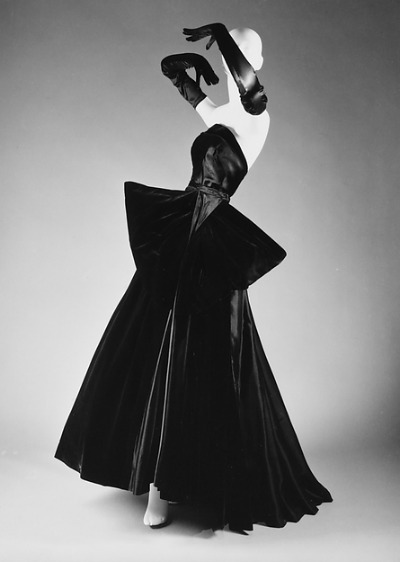 Yves Saint Laurent introduced the trapeze dress in his first collection for the House of Dior.